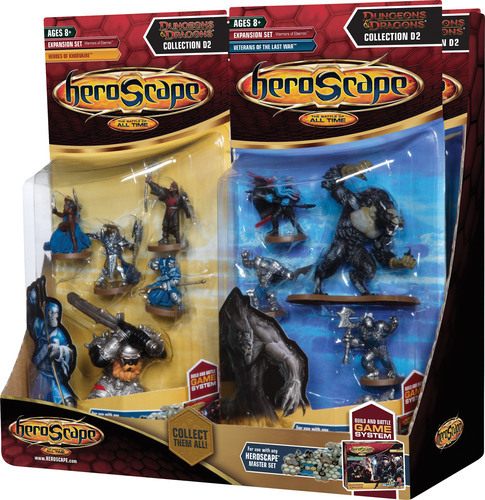 Warriors of Eberron is the second expansion set to Heroscape Master Set: Battle for the Underdark. It is also fully compatible with HeroScape Master Set: Rise of the Valkyrie and Heroscape Master Set: Swarm of the Marro. Blue Wyrmling - 1 figure and unit card; Red Wyrmling - 1 figure and unit card; White Wyrmling - 1 figure and unit card; Black Wyrmling - 1 figure and unit card; Iron Golem- 1 figure and unit card; Bracers of Teleportation treasure glyph and its card. Warforged Soldiers - 3 figures and unit card; Mindflayer Mastermind - 1 figure and unit card; Werewolf Lord - 1 figure and unit card; Cloak of Invisibility treasure glyph and its card; 3 lycanthropy markers. Ogre Warhulk - 1 figure and unit card; Goblin Cutters - 4 figures and unit card; Belt of Giant Strength treasure glyph and its card. Rhogar Dragonspine - 1 figure and unit card; Kurrok the Elementalist - 1 figure and unit card; Shurrak - 1 figure and unit card; Mika Connour - 1 figure and unit card; Heirloom - 1 figure and unit card; Brooch of Shielding treasure glyph and its card; 2 shadow tiles.